Quality, Reliability, and Safety ​you can trust! Pre-Fab Builders, Inc. ​was established in 1999. We specialize in commercial and industrial large-scale pre-engineered metal building applications -- from simple building canopies to expansive airport hangars capable of housing commercial, wide-body aircraft. We are affiliated with VARCO-PRUDEN BUILDINGS and NUCOR BUILDING SYSTEMS -- two of the leading pre-engineered metal building manufacturers in the U.S. We are signatory to California Field Iron Workers Local Union 433. 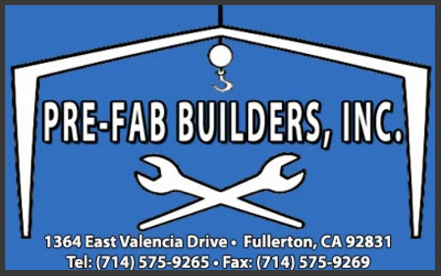 Pre-Fab Builders, Inc. is a certified Small Business Enterprise (SBE) by the State of California, Department of General Services. Our certificate number is: 1261880. Contact us at (714) 680-3060, (714) 575-9265, or (909) 874-3101, or (323) 567-2255 or visit us at our office.